The semiconductor strain gage may be thought of as a strain sensitive resistor. Generally when bonded to a stressed member, its resistance changes as a function of applied strain. This characteristic makes it useful in the fields of stress analysis, physical measurements, testing, transducer and instrumentation manufacture. 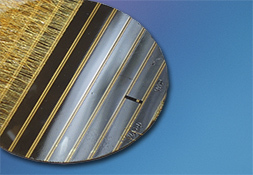 Additionally, the latest Silicon-On-Insulator (SOI) technology enables the fabrication of the high temperature strain gages with enhanced performance characteristics. These gages, as well as all other silicon based strain gages, are easily optimized for specific customer applications and have been found by customers to be truly superior to their foil gage counterparts.